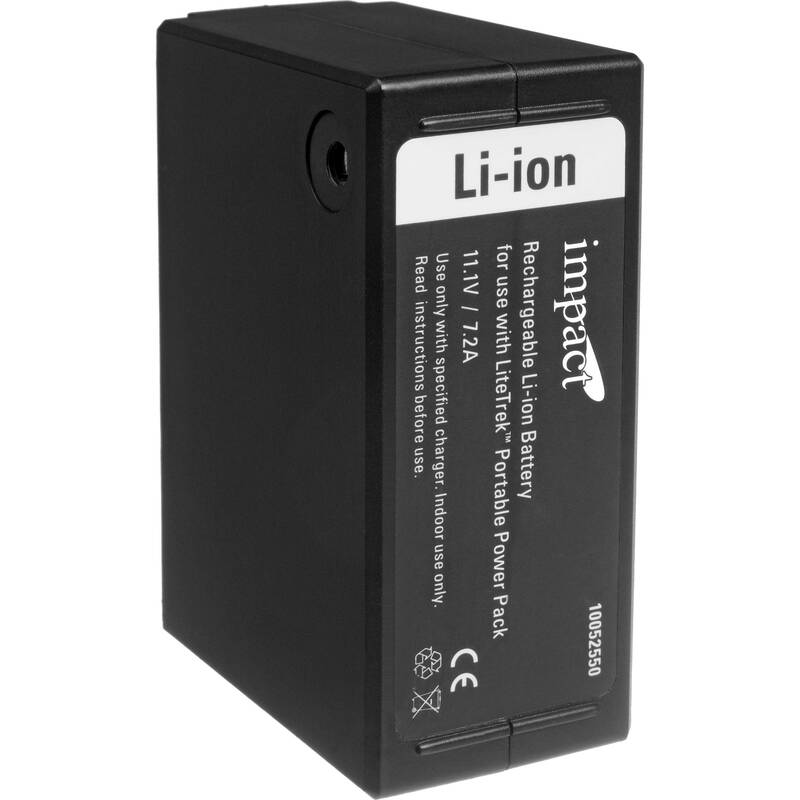 The Impact Mini LiteTrek (LT) Battery is a power source for the Mini LiteTrek (LT) Battery Pack system. It’s always wise to pack an extra battery for large shoots or out of the way places without access to AC power. The swappable battery instantly slips onto the Mini LT power module like a quality quick release mount. Capacity is 650 full power flashes or 3,500 1/64th power flashes with the Impact LiteTrek 4.0 monohead. Box Dimensions (LxWxH) 5.7 x 5.2 x 3.1"
Mini LiteTrek (LT) Battery is rated 4.6 out of 5 by 7. Rated 5 out of 5 by Anonymous from Off-brand solution! A bit of a preamble... I bought two of the Cameron brand portable battery powered 400w/s strobes called 'Translights' at Henry's in Toronto about 2 years ago, and they have been the best addition to my location kit ever! It's a small bag to bring as backup in case a speedotron runs amok on big shoots, perfect for shoots in restaurant kitchens as they're lightwight enough to superclamp to a shelf, or for quick location portraits. I LOVE THESE LIGHTS, have used the heck out of them, and now needed replacement battery packs. Think I could find replacements here in Canada? Not so. The B&H brand 'Impact' looked identicaltho to my Cameron Translights it's got to be coming from the same factory with a different brand name slapped on and sure enough my new batteries from B&H have worked like a charm. And if you you were looking for portable strobes, I'd say give the B&H Mini LiteTrek's a go, you won't be sorry. Rated 5 out of 5 by Kathleen from its the second one i get .. it last all day at 1/4 power ..its amazing how long it lasts and charges fast ..i will be buying a second set up before summer so my wife will have one also ..shes not very good at using strobes but she tells me these are easy to use with remote triggers . Rated 5 out of 5 by Nate in Maine from Excellent power and reliability I use 3 of the Impact units for my wedding lights, and needed to replace the battery for one of the units. Replacement was quick and easy, and the Impact unit is performing flawlessly once again. Lots of power and very reliable battery packs! Rated 2 out of 5 by Steven from Short Life Purchased with LiteTrek kit. Lasted one year with minimal use. Replaced under warranty. Replaced battery lasted one year, again with minimal use. Rated 5 out of 5 by Anonymous from Very happy I found a supplier for this Since buying a lighting kit that uses these batteries, I'd been looking everywhere and finally found them here. Powerful little units!! Rated 5 out of 5 by explorerbbq33 from Would buy again Need a new battery for my lighting system, works like new .. Lots of power..